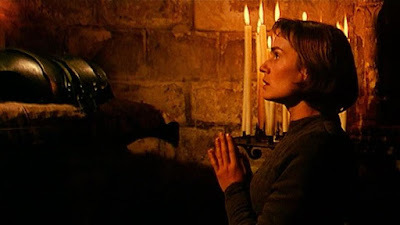 Jacques Rivette’s two part, five hour and twenty minute, epic documents the last two years of the life of Joan of Arc (Sandrine Bonnaire), from her initial attempts to meet with the Dauphin of France (André Marcon) and convince him that she was sent by God to lead his armies, to her capture and execution. The story of Joan of Arc has always fascinated me; a young woman, just sixteen when she set out, of such faith and conviction that she would put herself not just in harm’s way but insist on being at the head of the army, so certain was she that it was God’s will, and that only she could win this war for the man she saw as the rightful king, and thus God’s representative on Earth. It is no surprise that the story has been repeatedly adapted to film, it is inherently fascinating, dramatic, and provides an irresistibly challenging role for any young actress asked to take it on. Some versions have taken a ‘print the legend’ approach, but it seems that Rivette has tried to stick as closely as possible to what are seen as most likely to be the facts of Jeanne’s life and death. The film divides into two parts: The Battles and The Prisons, but the splitting of the film feels as arbitrary as the titles of the chapters. It takes over 90 minutes for the first battle to happen in The Battles, and longer for Jeanne to finish her battles and be imprisoned during The Prisons. The way to experience them is as a single narrative. That’s certainly an investment of time, but it allows you to immerse yourself in the story and in the film’s greatest asset; the astonishing performance given by Sandrine Bonnaire. 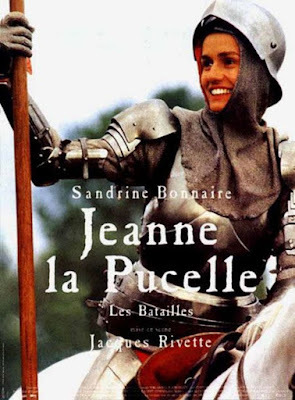 At 26 when the film was shot, Bonnaire is perhaps outwardly a little mature for the 16 year old Jeanne, but that works for the character because one has to believe that Jeanne must have possessed an air of maturity, a gravitas that would enable her to win followers and to get the Dauphin to entrust her with an army (even if that was the act of desperation that many historians now suspect it to have been). Bonnaire plays Jeanne as an uncommonly centered person, as someone with such belief in both the truth and the rightness of her cause that her certainty gives her the power to brush away concerns and to inspire others. Jeanne is not particularly subtle, but Bonnaire’s work is, she’s often best in quiet moments, letting several thoughts cross her face all at once. An especially good example of this is at the sentencing after her trial, when Jeanne is asked to ‘abjure’, to say that all she did was wrong, that she was never commanded by God, that she should not have cut her hair or worn men’s clothes to fight. She signs, under threat of being burned to death. Bonnaire gives us everything here: Jeanne’s certainty that she is lying by signing this statement, her consideration, her fear, her resignation and her shame. This is just one example of how Bonnaire builds a complex portrait of Jeanne, taking a legend and making her human. This is something we also see in the moments that Jeanne isn’t arguing her case, trying to win allies, or for moving ahead to the next battle. Rivette actually has little apparent interest in the battles, instead finding human moments to illuminate his and Bonnaire’s Jeanne. Whether it’s little moments of connection with soldiers who simply want to meet her and be inspired or a beautiful moment when the daughter of one of her captors asks Jeanne to bless her rosary, Jeanne tells the girl to ask her younger sister to touch it instead, that it will just as surely be blessed by her hand, these little scenes bring the character and the performance vividly to life. Just occasionally, we see Jeanne as the young woman she might have been if it weren’t for her calling; a few moments of lightness with her men and with the daughters of her captors. On the other side we see her in brief moments of doubt, or in pain, most notably when she’s told that she is to be burned to death. In that moment all of the toughness that Jeanne was perhaps faking to begin with and which we see grow for real throughout the film is stripped away and there is just a scared little girl. It’s devastating. 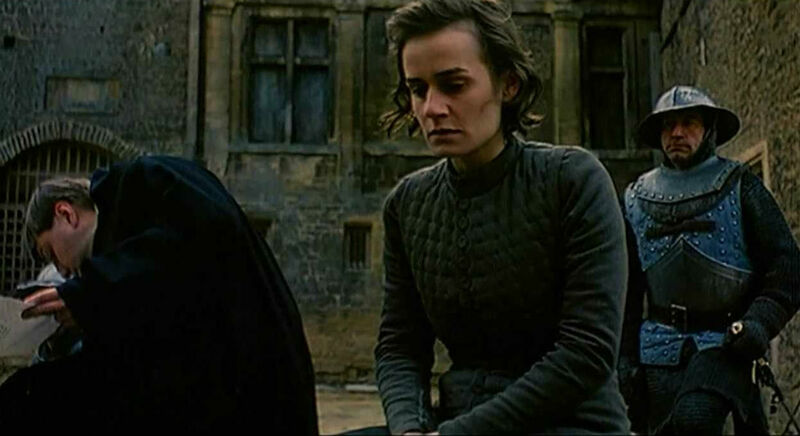 Bonnaire is certainly a well-regarded actress, but I’ve long thought that she’s somewhat undervalued, and her work here is up with some of the best performances I can remember seeing. Despite the title of the first part of the film, Jacques Rivette isn’t especially interested in battles. Of the film’s five hours and twenty minutes, perhaps five depict actual battle sequences. What interests Rivette is the process of getting to those battles and Jeanne’s influence during them, whether as a strategist or as an inspirational figurehead. The film shows Jeanne as part of a larger machine of war; an important part, an influential part (at least up to a point) and a forceful part, but a part rather than a general leading her army out from the front. The battles themselves are largely related to us by characters speaking to camera, almost as if this is a retrospective documentary about Jeanne’s life. What we see for the most part are the moments before and after, the interaction between the people fighting these battles is what interests Rivette. While he’s clearly no action director, Rivette gives us what feels like a realistic portrait of 1430 (though without the visceral grime of something like Paul Verhoeven’s Flesh and Blood) and his grounded camera means that you feel as though you are watching events unfold in a naturalistic way, adding to the humanising effect of Bonnaire’s performance. The film is lengthy and exhaustive, but it’s never dull. The politics are probably not well known to an English speaking audience, but the film, having allowed you to view the events on what feels like an intimate level, makes you want to learn more rather than become disconnected when you don’t have full context. It is interesting what Rivette chooses to leave out. Parts of Jeanne’s journey and her battles are largely described, but there is one other glaring omission. Her trial is dismissed with a single title card, and we are taken directly to her sentencing. I believe that this is essentially Rivette saying that there are already two outstanding films that deal exclusively with the trial, and that we should simply watch one or both of those. Some day I am tempted to try this, slotting a viewing of Bresson’s The Trial of Joan of Arc in when that title card comes up. Like its star, I don’t know that this film has ever entirely got its due. Some may be disappointed that it doesn’t lean more heavily on depicting the fighting of Jeanne’s war, but for me it’s a riveting exploration of everything surrounding those battles, anchored by an astounding performance that brings a fascinating historical figure to vivid and believable life. Both parts are available on UK DVD from Artificial Eye. There is a slight discrepancy in their pricing on Amazon right now. Part one can be had for under £4. Part two is a little more than £85. I’m not sure why. The DVDs are serviceable, but the source print on Part two is noticeably worse and both would benefit from a proper restoration and a Blu Ray release, perhaps for next year’s 25th anniversary?